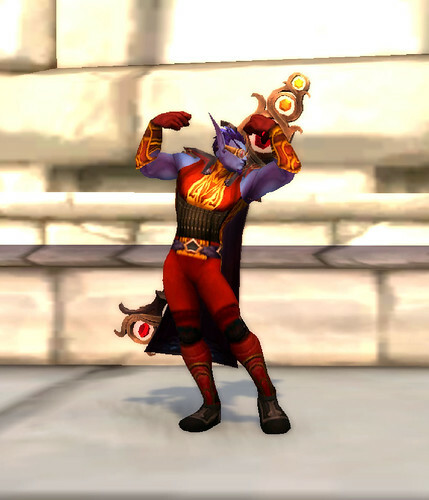 The January transmog contest was another "anti-tmog" event. In this contest, you needed to show up in all crafted gear, no transmogging allowed. It was fun to see what stuff was crafted by out contestants. Rainsong was the judge. From left to right: Jorsha, Angelinalynx, Angelous, Little Gimmlette, Glamdolf, and Piickles. Glamdolf was the winner with Jorsha in 2nd and Piickles in 3rd. February's transmog contest is "Tmog with a toy". Now, you cannot use a toy which changes your appearance. So things like the Super Simian Sphere, Brazier of Dancing Flames, or Bones of Transformation cannot be used. But there are so many things you can use like the Toy Train Set, the Honorary Brewmaster's Keg, or the Portable Audiophone. If the toy puts a hat on your head, you can use it so long as you incorporate it into your tmog. Remember, many of these toys have a duration of only a couple minutes with a cooldown of several hours. Make sure you time your toy to know when you can activate it relative to when you're called up for us to oogle your gear. If you have questions about whether your toy is acceptable, please ask. All gear letters should be sent to Glamdolf. 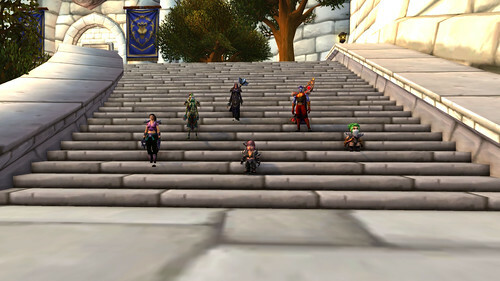 The transmog contest will be Friday, February 22nd at 9 pm in Stormwind. Check out the tmog thread for the transmogs from January.